DeborahRaeNelson.com designed and hosted on Squarespace. Hover is the domain registrar and website email provider. MailChimp is the email marketing platform. The good news is that artists no longer have to create portfolios requiring slides, printed pages, and binders. The expense and labor of updating and mailing portfolio presentations were immense. The internet with social media and websites provides a dynamic platform for sharing information. With that said, website design and technology change over time. My old site, created in 2012, was in need of a major overall. Particularly, it was not a responsive web design. 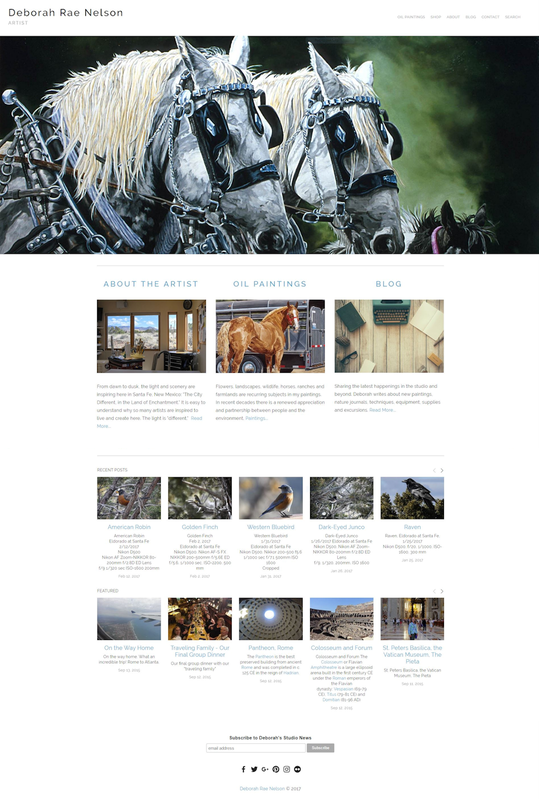 My previous website was designed with WordPress and Elegant Themes. HostGator hosted the site. Hover was domain registrar. The combination suited my site's needs for over five years. I began my redesign with the new Elegant Themes Divi theme. Divi and Wordpress together are powerful and flexible. However, I learned that I would need to upgrade my HostGator site to qualify for an SSL Certificate and purchase an anti-virus service to prevent hacks. The extras were adding up! I decided to take a step back and consider all my options. The project would require significant time, effort, and learning curve no matter which choice I made. I might as well do it right. This could be fun! Matching my website requirements and software experience with the website builders' features, I decided to sign up for the Squarespace 14-day free trial. Their customer service was available during the free trial period and I took advantage of their prompt and courteous help. The website builder environment means no more separate theme, plugin, security, and anti-virus providers. Blog posts are shared automatically through email and social media resulting in consistency and efficiency.